[PDF] Food as Medicine Everyday: Reclaim Your Health with Whole Foods | Free eBooks Download - EBOOKEE! Description: "Food as medicine" is a powerful approach to health and healing, intimately woven into naturopathic medical education. Dr. Jackson and Dr. Briley remind us that poor dietary choices are a major element in the exploding issues of chronic disease. What nutrients does the body need for healthy functioning? What foods have these nutrients? When shopping for these foods and preparing them, what strategies are helpful? What is a balanced meal? There are invaluable sections on how to read food labels, on healthy snacks for kids and strategies for converting kids' unhealthy eating patterns. Mealtime is tasty and uncomplicated with the wonderful recipes provided. Designed for families, the authors are family guides themselves, each with young children and busy professional lives. 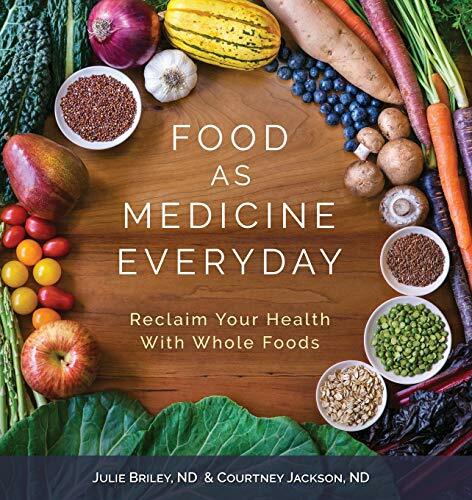 Food As Medicine Everyday: Reclaim Your Health With Whole Foods is thoroughly researched, beautifully written and elegantly illustrated while serving up a winning combination of information and practical application for the busy modern family. "Drs. Julie Briley and Courtney Jackson have filled an enormous gap in the field of medical nutrition. They offer for the first time a well documented, but easy-to-read, pathway to healthy eating that can be trusted by everyone." â€“Kent Thornburg, PhD, Director, Bob and Charlee Moore Institute of Nutrition and Wellness, Oregon Health & Science University "Drs. Briley and Jackson make critically needed connections between food choices and the real world dangers of illness that will provoke both thought and lifestyle changes. Their simple to follow and effective eating plan, including recipes, makes sense for anyone. Health seekers will treasure this delightful book, because it offers a compelling avenue for improved vigor and vitality." â€“Jessica Black, ND, Author of The Anti-Inflammation Diet and Recipe Book and The Freedom Diet. 2018-01-11[PDF] The Paleo Thyroid Solution: Stop Feeling Fat, Foggy, And Fatigued At The Hands Of Uninformed Doctors - Reclaim Your Health! No comments for "[PDF] Food as Medicine Everyday: Reclaim Your Health with Whole Foods".